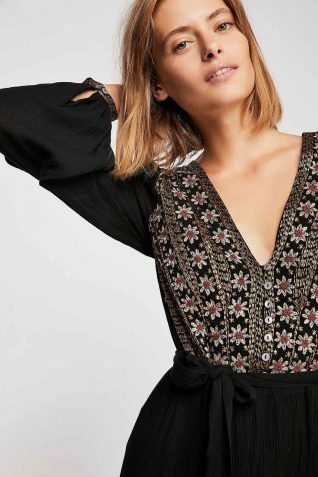 Free People “Heart’s Desire Embroidered Midi Dress” – spectacular long black dress featuring gorgeous floral embroidery design at bodice (front and back) and cuffs. V-neck and V-back, ties at waist, crinkly flowing fabric, easy comfortable flattering fit. Exquisite bohemian style, wow! Rayon. Length (size SMALL) = 147 cm.